The 21st Century Learning Initiative ~ School and Curriculum or Learning and Humanity? Much of this research has focused on the relationship between children and their parents; however, a caregiver can be any adult figure such as a teacher. In fact, when we consider that children are being put in schools at younger and younger ages for ‘head start’ type programs and that the brain goes through many intense periods of developing neuro-pathways from early childhood through to adolescence then clearly teachers are very essential figures (probably second only to the parents) in influencing a child’s development. Unfortunately, when we explore the semiotics of the classroom space we see that concern about a child’s behaviour goes only insofar as whether it is preventing the student or their peers from understanding the curriculum. This perspective combined with the traditional Christian values schools have been built on mean that challenges posed by student behaviour are thought of as actions to be disciplined and coerced out of the child. This effectively teaches the child to fear authority rather than learn how to meet their needs in a mature and empathetic manner. Non-violent communication is based in the belief that all violent behaviours stem from an attempt to meet ones fundamental needs whether physical or emotional. In fact, neuroscience validates that there are “three environmental conditions absolutely essential to optimal human brain development [which] are nutrition, physical security and consistent emotional nurturing,” (Mate, 2008, 185). Violence erupts when a person has learned an inappropriate way to meet their needs. In bureaucratic institutions like schools, children frequently are not getting these three essential needs met. Bullying on playgrounds, condescension in the classroom, varying degrees of comprehending concepts and personal life issues coalesce to create a great deal of challenge for students. Often in attempts to get emotional needs met students will employ obvious and often negative strategies. However, since the school has no interest in the child emotionally other than that the child is capable of completing the curriculum without distracting others learning, the school does not attempt to address the child’s needs or concerns, nor give the child any real power or authority over their own life. The result is that behavioral digressions are punished. This creates a temporary fix, but since the child’s fundamental need has not been addressed the child’s behaviour continues to escalate, meanwhile the schools means of discipline must also escalate until one of two scenarios occurs. One, the child after extreme amounts of coercion finally submits to the will of the classroom; or two, the child develops a disdain for schools and drops out as soon as they are presented the opportunity. In either case the child has suffered a significant blow to their sense of self-worth and has been emotionally crippled in dealing with their emotions. A person like this is then far more inadequate to give genuine empathy and is almost certainly unwilling to challenge authority. When we subject children to 13 years of strict authority, telling them that their emotions are to be ignored and attempting to meet fundamental emotional needs will result in punishment, we are effectively creating and reinforcing an oppressive system that feminism calls patriarchy. There is no bureaucratic cure for the impacts of having impersonal attachment relationships early in life. Our bureaucracies stress inhumanness; in other words, our bureaucracies are the problem. Teachers are expected to have control over students; they are responsible for student behaviour, managing safety, integrating students into the standards of society, transmitting government-determined knowledge, and assessing student results. Furthermore teachers are constantly warned about their actions around students—what is appropriate for a teacher to do and wear, whether teachers should give students hugs or not and how to present themselves in a “professional manner”. Teachers are legally obligated to keep files and assessment on students, report and manage strange or challenging behaviours in students and are not supposed to spend time with students or their families outside of school. The very institutions of society must be challenged to foster humyn connection and empathy. The extent of institutionalization has so deeply permeated western culture that even the family has been impacted. At what other point in humyn history has a family consisted solely of a child and a single parent? A home life consist of completely changing your living arrangements on a weekly basis to fit the demands of the divorced family? Or in the best situations, an isolated nuclear family due to the demands of work is forced to separate the parents from the child as early as only a few months after birth? This institutionalization has created a false dichotomy between members of a family; a separation between women and fetus, father and home life and turned children into property. 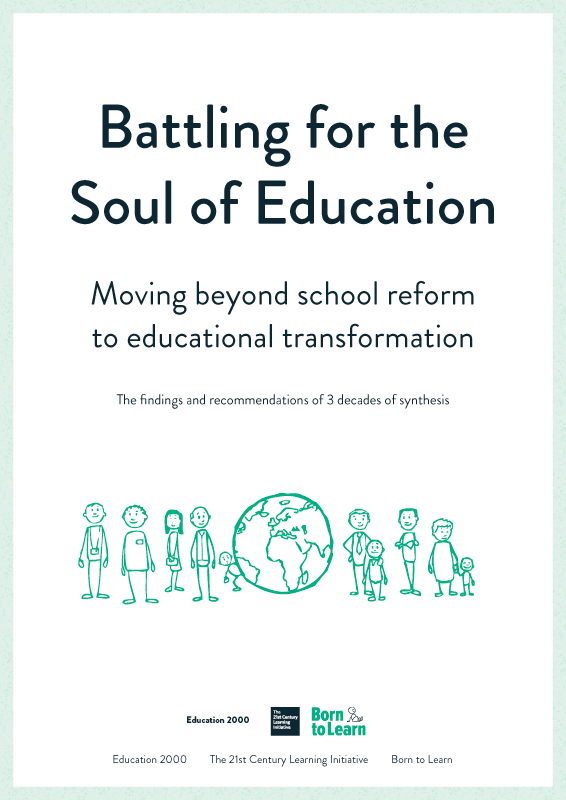 This very discourse creates the separation between life long learning and a linear progression towards credential, simultaneously leaving the question of education a discourse over what to impose on children. Learning as healing our collective consciousness rightfully brings parents, grandparents, children, siblings, aunts, uncles, friends and distant relations into the equation of learning, asking how do we grow together? To embrace humanity is to embrace life. To talk about life we have to first agree that life is something we want to live. Then we have to acknowledge life in its entirety. It is the messiness of emotions, feelings, love, connection, trust, community, respect, reliance, interdependence, growth, change, affection, care and all the turmoil that accompany these core elements of our existence. If we truly honor life above everything else then we immediately are invested in deep concern and care for each other; we want to see each other flourish. We end the discourses generated by our economy and begin the conversations of nourishment. When we embrace life we commit to the betterment of everyone. We invest in the true meaning of learning as an act of societal healing. Mate, G. (2008). In the Realm of Hungry Ghosts. Random House, Toronto Ont. Next: Why did we let it happen?